The GCC cooking oil market has been displaying steadfast growth over the past few decades. Changing lifestyle and increasing purchasing power have led to increasing consumption of processed food thereby benefitting the cooking oil market. Increasing investments for R&D to introduce new line of products is also favoring the GCC cooking oil market. On the other hand, Qatar cooking oil market is poised for steady growth in the upcoming years. Growth of the hospitality industry in Qatar has benefitted several ancillary industries such as food processing. The foray of international hotel chains to serve rising tourism has complemented the growth of cooking oils industry in Qatar. However, low small volume local production leading to high dependency on imports is challenging the growth of GCC cooking oil industry. High capital involved in intermediate processes of extracting cooking oil is restricting the entry of small players. This holds back the growth of GCC and Qatar cooking oil industry. Owing to a number of favorable factors, the GCC cooking oil market is likely to rise at a CAGR of 6.6% between 2017 and 2024. Qatar cooking oil market is likely to proliferate at a CAGR of 7.4% vis-à-vis revenue from 2017 to 2024. The GCC cooking oil market has been bifurcated in terms of product type into sunflower oil, palm oil, corn oil, and others. Of them, sunflower oil holds the leading market share as it is beneficial for human health. The Qatar cooking oil market is segmented on the basis of product type, package type, and region. In terms of product type, sunflower oil, palm oil, corn oil, and others are the segments into which the cooking oil market is divided. 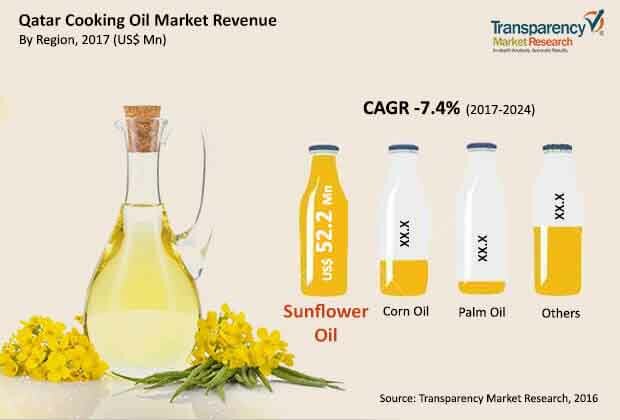 Sunflower oil, out of these, holds dominance and is anticipated to account for 71.5% share in terms of revenue by the end of 2024. Palm oil is anticipated to display declined share holding a meager 1.8% by the end of 2024. Vis-à-vis volume, sunflower oil is likely to hold 72.6% of the market by 2024. By package type, Qatar cooking oil industry is bifurcated into retail and bulk. Vis-à-vis revenue, retail package segments holds dominance and is likely to hold 76.1% by the end of 2024. In absolute numbers, retail package segment is anticipated to be worth US$93.0 mn by the end of 2024. Bulk package segment, on the other hand, is anticipated to account for 23.9% share until the end of 2024. In terms of volume, retail package is predicted to reach 33.7 thousand tons by the end of 2024. On the basis of region, countries of GCC and Qatar are the segments into which the GCC and Qatar cooking oil market is classified. The large population of immigrants from South East Asian countries such as India and Sri Lanka displays substantial demand for cooking oil in GCC countries. A large expatriate population from European countries is boosting the Qatar cooking oil market. Key players in the GCC and Qatar cooking oil industry include United Foods Company, Savola Group, Emirates Refining Company Ltd., Hayel Saeed Anam Group and Co., Asia Africa General Trading LLC, Ghurair Resources Oils and Proteins, and Omani Vegetables Oils and Derivatives Co. LLC.